Multi-screen Remote Desktop(MSRD) - fast, secure and affordable remote-control software that enables you to work on a remote computer in real time as if you were sitting in front of it. AdmWin 7.0 - With this software, you can use its remote commands, user name generator, password generator, and hardware or software inventory. Jeyo Remote 2.0 - Using the built-in capabilities of your mobile phone, Jeyo Remote can remotely operate the Windows operating system and any application running on your PC. PlanetRemote 2.0 - PlanetRemote is a unique software application that enables you to take control of your computer remotely and interact with its desktop as if you were sitting right in front of it! Remote Task Manager 3.8.2 - RTM even supports remote installations, enabling a systems administrator to set up a service on remote machines without ever having to physically go to them. Remote Tools Manager 2.0 - Remote Tools Manager is a powerful and flexible tool for SMS 2.0 administrator to get full control of a remote environment. Remote Vaccine - Remote Vaccine is a simple but powerful remote control application designed for administrators and teachers of schools, libraries, colleges, small businesses and more. 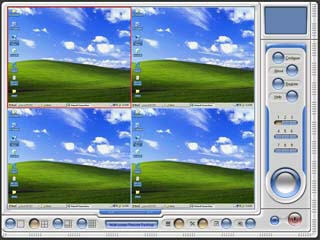 Net Control 2 4.16 - A remote control tool for administrators of school/office/home, realizes the possibility of performing operations on several computers simultaneously. Anyplace Control 3.0 - The software displays desktop of remote computer on your monitor and allows you to use your mouse and keyboard to control remote PC. WinLock Remote Administrator 1.32 - Configure remote WinLock clients, lock remote workstations, and apply security profiles by easy-to-use interface. Radmin Remote Control 3.1 - A secure remote control and remote access software that enables you to work on a remote computer, helps you to access your remote computer from anywhere in the world.